Many will have read a disturbing tale on Daily Mail Online recently indicating that up to 1.5 million people have been sold overpriced wills by our high street banks. In the 1990’s and early 21st century some banks were offering will writing services and free wills provided that you banked with them or offered wills at a discounted rate compared to those offered by solicitors, traditionally the bastions of this area of expertise. A large number of these wills included small print that could end up leaving your proposed beneficiaries out of pocket for a number of reasons. In the small print, one bank reserved the right to act as executors of your estate when you passed away, which means that the bank rather than family, friends or your law firm would be responsible for the estate and inheritance tax, sale of home etc. Worryingly, in return for acting as executors, this one bank would charge an administration fee of £1,500.00 and then 2.5% of your total estate. The report added that another bank reserved the right to charge 4% on estates up to £500,000 and a fee of 3% extra for the next £500,000. The banks argued that clients were informed from the beginning. Many have been able to reduce these fees especially when the estate consisted of minimal assets and where assets were generally being passed to a surviving loved one, such as a husband or wife. Unfortunately, many have had to pay the full amount as they didn’t read the small print. Many people who unknowingly drafted their Wills via banks are now trying to extrapolate themselves from what most people would see as a very unfair arrangement. This though is no easy task and incurs further charges. 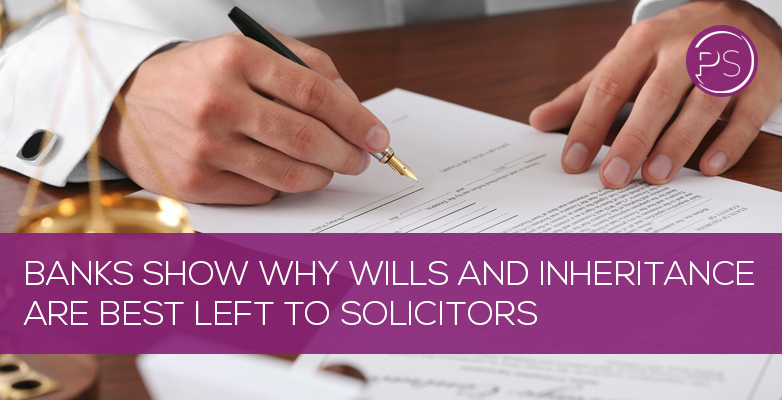 If you have entered into such an arrangement with a bank and want out, or generally need advice and help on wills and inheritance tax, we are happy to help and ensure you do what is best for your family, which is ultimately the goal of all good solicitors. With indemnity insurance, expertise and the ability to talk through everyone’s unique case, wills solicitors in London and elsewhere remain the safe option as this sad tale demonstrates. Pindoria Solicitors offers of a time based charging service with an estimate of likely costs once we have seen the extent of the work involved. This (sometimes) can work out cheaper than a fixed fees.